I've always known that Paul McAuley can write, as far as I am concerned he's one of the finest writers in the genre right now however he's also vastly under-appreciated. 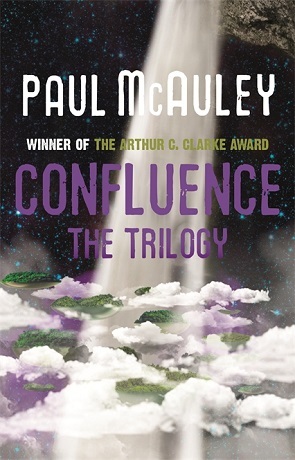 I'm really hoping that the release of confluence will help in addressing this oversight - not only is it an incredibly well written omnibus but it has a broad appeal and should delight fans of fantasy and science fiction equally. Confluence collects the novels Child of the River, Ancients of Days and the Shrine of Stars - re-edited by the author to seamlessly tie the story together. Confluence itself is a long and narrow artificially created world, half of which is fertile and verdant river valley - centred on the Great River - and half crater-pocked desert. Served by a multitude of autonomous machines, it's a world who's architects seem absent and is populated by ten thousand bloodlines who worship their creators as gods. Each bloodline have their own distinct attributes, many of which seem to be animalistic in nature. Confluence is also the home of Yama, a young man who was raised by an obscure bureaucrat in an obscure town in the middle of a ruined necropolis after being found as a young boy floating in a white boat on the world's Great River. Yama's bloodline does not seem to be shared by any other living on Confluence, he instead appears to be the last remaining evidence of the "Builders" - the closest of all races to the revered architects. The attributes his bloodline allows seem to include the ability to control the very machines who maintain the world. For Yama finding out who his Ancestors and family are is a journey of discovery, a journey that he hopes will uncover who he is and how his Bloodline connects to Confluence and "the Preservers". I've read a few of McAuley's novels now and each time I am impressed with the powerful voice, conviction and eloquence of his prose, not to mention his mind-expanding ideas and descriptions of future tech. The author originally penned these novels just prior to the Millennium and yet they don't feel dated in any way at all. The world-building is simply incredible and I just love the feeling that the book imparts. The creators of advanced technology are long gone and are treated pretty much as divine beings while technology itself is considered magical - similar in structure to those created by Wolf and Zelazny but with a style that is uniquely McAuley. There is this wonderful merger of the rustic swords and bows level of society with genetic modification, laser weapons and hovering platforms. It works incredibly well and provides one of the most effective pieces of world-building I've seen. Against this we have the characters themselves and each player on McAuley's stage is treated with special care, living and breathing in the living breathing world of Confluence. I love the idea of the Bloodlines, here family traits are exagerated with animal-esque abilities and appearances. These traits aren't limited to just appearance, the differences are genetic and affect behaviour too. I think it makes a lot of sense making this series an omnibus, the books are directly connected and form one big story arc and reading them together it feels very much one continous book much in the same way that The Lord of Rings is one story arc split in three parts. Pacing is just about right and there are very few pauses to speak of, the plot moves forward well and given the size of the book it's a relatively swift read as a result. Immersion is both ineviatable and immediate, the feeling of being a part of the story is very strong and pulls you along Yama's journey to find out where he comes from and the boundaries of his abilities. Confluence is incredible, for me it hits the perfect balance between world-building, characterisation and plot. The term "speculative fiction" could have been made for this book, a science fiction novel that reads like a fantasy and a memorable story that hits all the right notes. Written on 22nd April 2014 by Ant.